SILICON SLOPES, Utah – October 17, 2016 – Domo, provider of the world’s first cloud-based platform for business optimization, today announced that Domo Mobile has been named a winner of Ventana Research’s 2016 Business Technology Innovation Award for Wearable Computing. This is the second consecutive year that Domo has been recognized by this prestigious awards program. 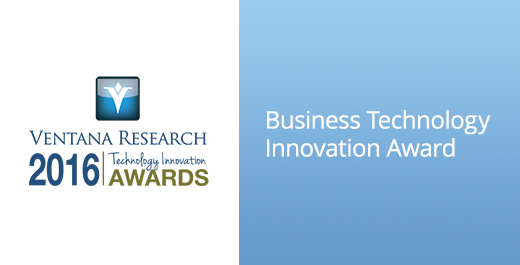 Presented annually by Ventana Research, the Technology Innovation Awards recognize pioneering vendors that have developed clear visionary and transformative technology. The recognition showcases what technology vendors have done to advance the computing potential of their applications and technology so that it can be used to drive better efficiency and productivity as well as the outcomes and performance of an organization. This recognition highlights Domo Mobile’s ability to give employees access to the insights they need anytime and anywhere in order to make better, faster decisions with confidence and take action to improve performance when there is still opportunity to impact business results. As part of the Ventana Research Technology Innovation Awards scoring process and methodology, Ventana Research examined the submissions to evaluate the technology’s innovative approach and how it applies to the people, processes, information and technology as well as the best practices it supports, the degree of team involvement and the technology’s business impact and value. Ventana Research is the most authoritative and respected benchmark business technology research and advisory services firm. It provides research-based insight and expert guidance on business process and mainstream and disruptive technologies. To learn how Ventana Research advances the maturity of organizations’ use of information and technology through benchmark research, education and advisory services, visit www.ventanaresearch.com.